Hello and welcome to my blog. There's lots said about why climate change now confronts us, and what it means, but the real issue is what to do about it. Plenty is said about that too, but there's not enough discussion on the practical aspects of implementation. Focusing on energy, that's what my blog sets out to achieve. As COP 19 rolls on in Warsaw, both delegates and observers that I have talked to are seeing little agreement, despite the sometimes upbeat assessment coming from the UNFCCC. It may well be late on Friday or even Saturday before something appears from this COP. Meanwhile the side event and external (to the formal COP) conference programmes continue. It is through these processes that participants can meet and discuss various aspects related to climate change. This being a meeting about climate change, it might be expected that attendees would be interested in hearing about carbon capture and storage (CCS), but it turns out this is a hard sell here. 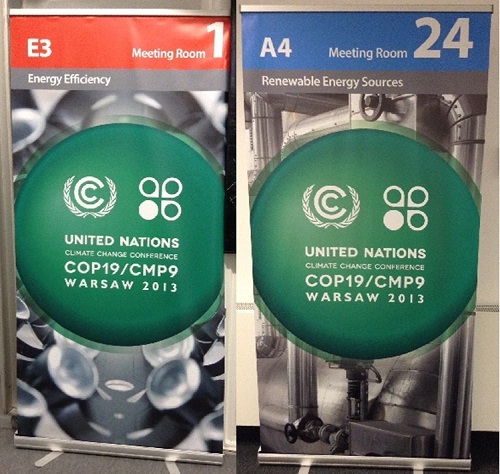 The problem seems to start at the COP venue itself, where the meeting room banners feature various approaches to energy and environmental management. CCS doesn’t get a mention. All I could find were Energy Efficiency, Renewable Energy Sources, Air Protection and Water & Wastewater Management. This theme continues in many presentations, speeches, dinner conversations and panel discussions. While CCS does of course feature when organizations such as GCCSI hold events, at more general climate solution events it struggles to hold its own. Rather the focus is solidly on energy efficiency and renewables. Neither of these are anything close to sufficient solutions to the climate problem as it stands today, yet you could sometimes come to the conclusion that this is what the COP is actually about. Energy efficiency has transformed global industry since the first day of the industrial revolution. Everything we do is possible through a combination of technology innovation and energy efficiency, from power stations to vehicles to mobile phones. The result of this has been tremendous growth, but with it has come a continuous rise in greenhouse gas emissions, particularly CO2. We use more goods and services, buy more stuff and travel further than at any point in human history and there is no apparent let up in this trend as it continues to pervade the entire global economy. But now energy efficiency is being sold as a mechanism for reducing emissions, throwing into reverse a trend that has been with us for over 200 years and fundamentally challenging economic building blocks such as Jevons Paradox. A parade of people representing business organizations, environmental NGOs and multilateral institutions will wax lyrical about energy efficiency. In one presentation an airline industry spokesperson talked about the tremendous improvements in efficiency the industry was making, through engine design, light weighting, route optimization and arrival and departure planning. There is no doubt that this is happening, but it is also bringing cheaper air travel to millions of people and of course forcing up emissions for the industry as a whole. There is no sign of this trend reversing itself. Adding a carbon price to the energy mix is the way to change this trend and still make energy efficiency improvements. The renewable energy story is told in a similar way. While there is also no doubt that the application of renewable energy is bringing benefits to many countries, offering distributed energy, providing off-grid electricity and supplementing the global energy supply in a tangible way, the global average CO2 intensity of energy has remained stubbornly the same since the 1980s when it dropped on a relative scale (1990 = 100) from 107 in 1971 to 100 in 1987 (Source: IEA). It was still at 100 in 2011. This is not to say it will never change, but simply advocating for renewable energy is very unlikely to take us to net zero emissions before the end of this century. The fossil fuel base on which the economy rests is also growing as demand for energy grows. As recent IEA World Energy Outlooks have repeatedly shown, much of this new demand is being met with coal. The only way to manage emissions from coal is the application of CCS, yet this seemingly falls on deaf ears here in Warsaw. When CCS does get a mention, it is increasingly phrased as CCUS, with the “U” standing for “use”. In her one upbeat mention of CCS that I have heard, UNFCCC Executive Secretary also referred to it as CCUS. In another forum, one participant even talked about “commoditizing” CO2 to find a range of new uses. The problem is that CO2 really can’t be used for much of anything, with one modest (compared to the scale of global emissions) but important exception. The largest use today is for enhanced oil recovery where the USA has a mature and growing industry. It was originally built on the back of natural CO2 extracted from the sub-surface, but the industry now pays enough for CO2 that it can provide support to carbon capture at power plants and other facilities (usually with some capital funding from the likes of DOE). This has helped the US establish a CCS demonstration programme of sorts. There are other minor industrial gas uses (soft drinks), some scope for vegetable greenhouses such as the Shell project in the Netherlands (which provides refinery CO2 to Rotterdam greenhouses for enhanced growing, rather than have them produce it by burnaing natural gas) and a technology that quickly absorbs CO2 in certain minerals to make a new material for building, but all of these are tiny. The problem is that CO2 is the result of combustion and energy release and therefore any chemistry that turns it into something useful again requires lots of energy – nature does this and uses sunlight. Even if such a step were possible, this wouldn’t change the CO2 balance in the atmosphere, just as any bio process doesn’t change the overall balance in the atmosphere. Only sequestration, either natural or anthropogenic, changes that balance. “Show me the money” or CO2 mitigation at COP 19 ?? Hi David, thanks for another insightful and thought-provoking blog post. What you describe can be observed in so many different contexts, but it is perhaps most acute at the COP venues. This has perplexed and frustrated me now for the last 5+ years during which I have worked actively to promote sound application of CCS (after I spent 5 + years in an R&D dept. developing CCS knowledge and methodologies). I have worked on feasibility projects for CCS in many places, including Poland. My current conclusion is that CO2EOR with CO2 from capture plants is perhaps the only way to get CCS out of the “starting blocks”. CO2EOR by itself is not a great climate change solution, but if the CO2EOR project eventually integrates aquifer storage such that the capture plant can continue to operate after the CO2EOR project no longer needs new CO2, it will be better than our current “do nothing” strategy for coal. Thanks for the comment. I am glad it isn’t just me who thought this. Thanks for this article. I’m currently highly skeptical of CCS – see these recent comments (one and two) at planet3. I’m happy to be convinced otherwise – the rationale for CCS is bombproof, it’s just I am extremely queasy about seeing the UK CCS roadmap talking about 3000 global projects by 2050 and a fifth of co2 reduction targets from a technology we’ve only currently made economically viable via EOR, at a very small number of sites. My comments above also worry that it’s just a bit too convenient for the fossil fuel industry. Entirely understandably, from their point of view – it makes perfect sense to fund research into an option that causes the least disturbance to the business model in the medium term. But from the point of view of getting where we need to go, I worry about tech lock-in. If there’s any material you could throw my way, I’d appreciate it. I’m looking for something that makes a strong case that non-EOR CCS is both technically and economically viable. At the moment, to me, it looks a lot like vapourware – and certainly not something I’m comfortable anyone pinning 1/5th of our needed reductions on. Of course, it’s difficult to predict what the economics of any emerging tech will be down the line – but that’s kind of my point. It can’t be a good idea to build mitigation strategy on such economic uncertainties, can it? The common response to that seems to be: the carbon is going to be burned, so we have to make CCS work. That strikes me as an unacceptably high-risk strategy when, in fact, there are other alternatives. p.s. I’m just reading back through your CCS category on this blog, apologies for not doing that before I commented.